You’ve been very successful getting people to your website by creating content and optimizing your website for search, but now what? Where are the conversions? You can be selling car parts, reusable water bottles, customized socks, or anything else you can think of – regardless of what you’re selling, you have the same overarching goal as any other online store. That goal is to sell your products. It’s time to move consumers deeper down the sales funnel past the awareness stage because it’s not just about getting people to your site anymore. In ecommerce, you want your users to engage with your website, and that means spending money. In the consideration stage, shoppers have done their basic research and they have options to pick from. Now as they are shopping, they are looking for the option that stands out from the rest. Their other option might be another product on your site, or it might be a product from a competitor’s website. Either way, you’re going to want to gather information about your shoppers in this stage so you can use the metrics to develop a strategy to get them to the purchasing stage. Your goal might be to direct them to complete the purchase, purchase a product at a higher price point, or choose your store over a competitor. Clicking the “Shop Now” CTA on your homepage. This metric shows that people got to your website, but now they have expressed interest in possibly making a purchase on your ecommerce website. If this metric is showing low numbers, you can create a more prominent call-to-action. This might be a change in copy, design, functionality, or all three. Using a program like hotjar can help you determine why users are not engaging with your CTA. Adding products to the shopping cart without purchasing. This metric can tell you a lot about how shoppers are engaging with your website. If this metric is very low, it either means people aren’t adding products to their cart or they are mostly purchasing– this can only be determined by looking further into you other ecommerce analytics. If this is a high percentage, you’re going to want to implement new methods to drive shoppers into the purchasing stage. This might include offering discounts and other offers, or carrying out retargeting campaigns to those shoppers. Email collection. If you have any type of email collection on your website, you should be tracking it. Setting a goal for this micro-conversion is important because it is showing you how many people are actually expressing interest in shopping with you in the future. This metric will not only help you gauge how successful your website is in capturing leads, but it also provides you with all of the information that you need to help you drive that customer further down the sales funnel. Now how do you track these metrics, and any other micro-conversion goals that you set for yourself? First, begin with setting up a Google Analytics account for your website. Google Analytics is free to use and it tracks everything that you will ever need to know about your website and its performance. Destination goals treat page views as a conversion. Duration goals treat the length of session time as a conversion based on the minimum time you set. Event goals treat any type of user interaction with your site as a conversion. Page/Screens per session goals treat users who view more than the minimum pages you set as a conversion. These are four very broad goal types that you can customize to create your own customized ecommerce micro-conversion goal, so virtually any action you want to track can easily be tracked with Google Analytics. In this stage, the shopper is completing the purchase and converting into a customer. You have achieved your main goal, but you’re work isn’t done yet. At this point, you must determine if you saw a return on investment and if this purchase is actually profitable for your business. Average order value (AOV) is how much a customer typically spends in a single order. You know your business better than anyone, so you should already have an idea of how much someone should typically be spending. If most of your products are between $7 - $10 and the AOV is $50, you can assume that most users are purchasing several items at a time. Use this information to adjust your digital marketing strategies. If AOV is lower than you want it, implement an element on your website that shows recommended products or offer discounts to shoppers in order to upsell. Cost per acquisition (CPA) is a metric that you can use to measure the impact of your marketing campaigns. The simplest way to find this number begins with linking your Google Ads and Google Analytics accounts together. You can learn how to do that here. From there, you’re going to look under in the acquisition section to find your campaigns. This is where you can sort through the efficiencies of your campaign and determine ecommerce conversion rates, number of transactions, and revenue. Your CPA is going to be the cost of your marketing campaign divided by the the number of transactions. With the revenue data, you can also determine your return on investment (ROI) for the campaign. Once you’ve acquired new customers, you’re going to want to work to retain them. Retaining a customer can be from five to 25 times more profitable than acquiring a new one, according to the Harvard Business Review. Using Google Analytics, check your audience overview to see the overall percentage of new vs. returning users. This will give you an idea of how many people are returning to your website, but not necessarily who’s returning to make a purchase. Creating audience segments will allow you to track new vs. returning users for many different metrics. Google shows you have to create custom audience segments here. This is a surefire way to see how many of your customers are repeat customers. From this information, you can develop marketing strategies aimed at retention. Depending on your ecommerce business, there are many different tactics you can do. For example, if you’re selling a product that is used and replenished often (razors, laundry detergent, or paper towels), offer a convenient subscription service. Amazon is successful at this strategy with their “Subscribe & Save” discounts on these types of products if you sign up for repeat deliveries. Now that you are equipped with several different ecommerce metrics, set up your Google Analytics account and begin tracking them immediately. The quicker you gain this important insight on your online store, the quicker you can get started on putting that data to work. 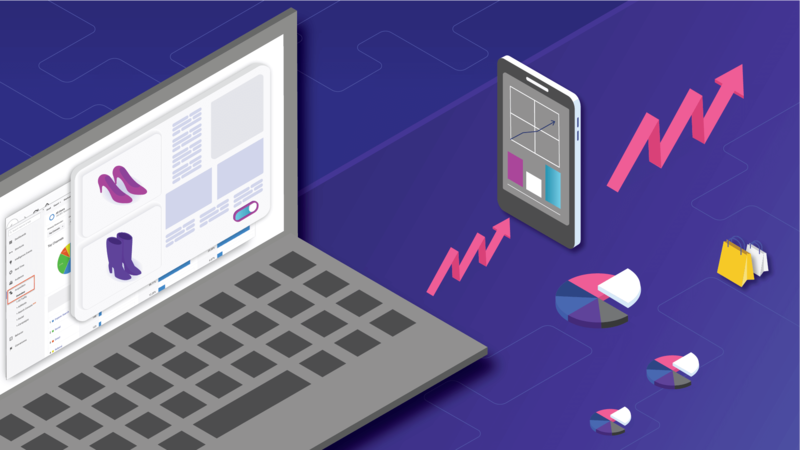 There are many different digital marketing strategies that you can put into place on your ecommerce website that will help drive shoppers down the sales funnel into making a purchase, and this newfound data will help you determine which to implement. You can learn more about these digital marketing strategies from the ecommerce experts at Electric Enjin. See how we can help your online store grow today with our ecommerce services.